The negotiator of the Greek Cypriot side at the ongoing talks for a Cyprus settlement, Ambassador Andreas Mavroyiannis is in Brussels on Tuesday to conclude a series of meetings with President Jean Claude Juncker`s Cabinet. Chief Commission Spokesman Margaritis Schinas, confirmed that “Mr Mavrogiannis is today in Brussels and as we speak in this very building” for a series of important meetings. Asked to elaborate on the framework of his meetings, Schinas recalled the Nami – Mavrogiannis visit to President Juncker, earlier in 2016 “which is very normal given the central role the Commission plays in the Cyprus settlement talks”. Andreas Mavroyiannis is meeting the Head of the Juncker Cabinet, Martin Selmayer and EC Directorate General of Legal affairs chief Louis Romero. The UK Prime Minister Theresa May said she is hopeful that talks to agree on the reunification of Cyprus will continue and reach a successful conclusion, adding that her Government is ready to play its role as a guarantor power. Theresa May: We stand ready as a guarantor to pay our part to ensure that we can see a successful conclusion of these talks and see that reunification of Cyprus which people have been working for some time. During a House of Commons session on Wednesday afternoon, Mrs May was prompted by David Burrowes, a Conservative north London MP representing thousands of UK Cypriots, to “seek support for a united and independent Cyprus, free of Turkish troops” during her visit to Ankara at the weekend. The Prime Minister will be in the Turkish capital this Saturday to hold talks with President Tayip Erdogan and Prime Minister Binali Yildirim. She will be flying to Ankara straight from Washington D.C. where the previous day she will have been the first foreign leader to be received by the new US President Donald Trump at the White House. Responding to Mr Burrowes’s question, the Prime Minister said: “I am hopeful the talks will be able to continue to come to a solution; I think we are closer to a solution than we have been before. I have already talked both to PM Tsipras and to President Erdogan already about the need to ensure that we are creative in the thinking and finding a solution for this and I had further telephone call with Nicos Anastasiades over the weekend about this very issue. The Prime Minister’s spokeswoman had earlier told the Cyprus News Agency that Theresa May will convey to Ankara her Government’s will to continue to help keep up the momentum in the Cyprus settlement talks and to assist in reaching a positive outcome. The spokeswoman noted that the Prime Minister decided early on after taking up her duties that Turkey would be one of the countries that she would want to visit sooner rather than later, as it is “such an important partner” on security, defence and trade. She added that the visit will be an opportunity to discuss the bilateral cooperation on security issues, such as intelligence sharing and combating Daesh in Iraq and Syria. Cyprus President Nicos Anastasiades and Turkish Cypriot leader Mustafa Akinci continued their negotiations on pending issues relating to the internal aspects of the Cyprus problem, in Geneva on January 9-11, while a Conference on Cyprus took place there on January 12. Downing Street spokesperson: Τhe Prime Minister made clear that the UK would continue to do all we could to help achieve a successful settlement. The sad news of George Michael, Georgios Kyriacos Panayiotou’s passing has shocked fans around the world. Many of these people have visited his home in Highgate North London, to make their tributes, to lay-down flowers, cards, candles and personal messages. You will see a Greek and a Cypriot flag put on the fence’s gate to make the point visibly he was one of their own. With fans silently reflecting and contemplating his career, his musical achievements and even his kindness and generosity for charity, in his 53 years on this planet. This included the singer pledging his signed-discs for London Greek Radio‘s Radiomarathon appeal. Over 3,000 signatures for George Michael petition…. Mr Vasiliou who is a driving instructor and owns a hair salon with his wife, in Muswell Hill, he saw the last ever Wham! Concert, makes a super fan in our book. He would like nothing more than to have a permanent installation as a way of honouring the man and his work, every time to see it, at The Grove, in Highgate, George Michael’s house. 3,572 plus people have placed their signature on this petition in the weeks since the singer’s death on the 25th December 2016, Christmas day. The petition will be handed to the Prime Minister and Leader of the Conservative Party Teresa May MP at 10 Downing Street, London, January 2017. The National Federation of Cypriots in the UK has welcomed the progress made towards finding a lasting and viable solution that reunifies Cyprus and its people, expressing “cautious optimism” following the Geneva conference on Cyprus. In a statement the Federation notes that a number of crucial issues remain unresolved, but also highlights a few “firsts” in the reunification negotiations in Geneva. It also comments that for the first time a multilateral conference on Cyprus’ future security arrangements, was held during which Turkey engaged in a dialogue, with, amongst others, the Republic of Cyprus to discuss the removal of the anachronistic system of guarantees and withdrawal of the occupying troops. Referring to the Turkish President Erdogan’s statement following the Geneva conference that Turkey will remain in Cyprus “forever”, the National Federation speaks of “unacceptable” comments, that are also “unhelpful” in the context of the current negotiations. Stella Stavrou is 75 years old. 4’11 approx. Small frame. Scars on her face from diabetes, she was wearing a black & white knee length coat, black leggings, mulberry coloured round scooped neck long sleeve top, black beanie hat and black quilted hand bag with long gold chain handles, black shoes. She was last seen on Sunday, 15th January approx 2pm and told her family she was going to the Whittington hospital to visit their father. She did not arrive at the ward and she has not returned home since. She suffers from dementia and diabetes and has not had her medication since leaving the house yesterday, so she may appear very confused and disorientated. Stella is Greek-Cypriot speaking only, with patchy levels of spoken English. The areas she may have gone to are Finsbury Park, Holloway, Archway, Haringey and Clissold Park. She would have walked and/or taken the bus on these routes. Any information please contact the police on 101. Good news, Stella Stavrou aged 75 from Islington has been found safe and well. Thanks for your help with this appeal. The outcome of the Conference on Cyprus which focused on security and guarantees, which started on Thursday in Geneva, creates the preconditions for a radical change of the security conditions that were in place in 1960, President of the Republic of Cyprus Nikos Anastasiades, has stressed. In statements at a press conference in Geneva, President Anastasiades said that the fact that the UN press release, issued after the Conference on Cyprus, clearly describes the intention of the participants (at the Conference) to reach a mutually acceptable solution – as regards the aspect of security and guarantees – that will meet the expectations of both Cypriot communities, but particularly the fact that it is acknowledged that the security of one community cannot constitute a threat for the other community, “create the prospects and the terms of reference for the team of experts to work out new ways that would be acceptable and for radical change of what was in force based on the 1960 guarantees`. President Anastasiades further said that for the first time a multi-party Conference on Cyprus was convened, in the presence of the EU, on the highest possible level, during which Turkey was for the first time engaged in a dialogue with the Republic of Cyprus, to discuss the abolition of the guarantees and the withdrawal of the Turkish occupation troops from Cyprus. The presence of Turkish troops in the Republic of Cyprus does not secure conditions of peace, but conditions of instability, the Cypriot President stressed. Furthermore, he said that what is important is that `we are at the negotiating table with Turkey and the other guarantor powers not to confirm the 1960 Treaties but to find a solution that would meet the concerns of all the people of Cyprus. And the concerns of the Greek Cypriot side are the presence of the occupation army, the Turkish guarantees. That is why the subject of the Conference was the discussion of the security and guarantees issue”. The President added that the decision to continue the Conference on Cyprus shows that the issue of security and guarantees and the implementation of the solution, constitute the beginning of a substantive dialogue for the achievement of a solution, so that its outcome meets the expectations of the Cypriot people. He stressed that the only comprehensive proposal which is before the Conference is the proposal submitted by the Greek Cypriot side which served as food for thought for all participants. On Thursday, he said, `a dialogue began to change everything we knew until today` and added that his proposal includes matters relating to the internal or external security, as projected by the Turkish side, or ensuring a smooth and consistent implementation of what will be agreed or even ensuring constitutional order after the solution. President Anastasiades noted that for the first time since 1974 the Turkish Cypriot side submitted a map on the territorial adjustments through which there is a significant percentage of Turkish occupied land returned under Greek Cypriot administration. He stressed that although the map submitted by the Turkish Cypriot side does not meet the Greek Cypriot side`s expectations, nevertheless, bearing in mind the Greek Cypriot side`s proposal on territorial adjustments, it constitutes the basis for negotiation. He also said that the maps that have been published by some media are not the ones that are kept by the UN. Invited to say when he believes that a final agreement will be found, he pointed out that never before have we had a discussion on the territory in the form it is discussed today and the submission of maps on behalf of the Turkish side, never before have we had Turkey sitting on the same table with the Republic of Cyprus, the Greek Cypriot side, the Turkish Cypriot side and the EU to discuss abolition, amendment, or withdrawal of its occupation troops. `So, we are on a track that creates hope but this depends on the positions of each side`, he pointed out. Replying to journalists` questions, the President said that there is no final date as regards the work that the working group of deputies on security and guarantees that will commence on 18 January to identify specific questions and the instruments needed to address them. “This is the beginning of the dialogue”, he said, adding that the committee that has been established to examine the concerns and probably some suggested solutions, could lead to a conference on political level, on the highest maybe level, to discuss the decision. If there is no conclusion on that day, he said, then the dialogue will continue to achieve a convergence. Moreover, he stressed that there is no difference of approach between Nicosia and Athens and warmly thanked the Greek government and the Foreign Minister Nikos Kotzias for their excellent cooperation and support. He also thanked the UNSG, the EU Commission President and the EU High Representative, the political party leaders, his negotiating team and the Media for the coverage. The reason why the Conference on Cyprus did not continue on Friday as well, is due to the fact that the Turkish Foreign Minister had to leave earlier for Turkey for internal issues, the Cypriot President said. Asked if there is hope for a solution in Cyprus, he said that if Turkey did not want to cooperate, it would not have been present at the negotiating table. Hope is one thing and final outcome is an other thing, he said. Replying to an other question, he said that if Greece and Turkey insisted on their positions there would not be any reason to establish a committee that will examine all aspects o the security issues, nor would there be a decision on behalf of the parties to discuss in order to reach mutually acceptable solutions, meaning that the Republic of Cyprus or the concerns of the Greek Cypriot community can not be ignored. Referring to the EU role, he said that the EU will surely have a word so that the agreement reached will be compatible with the European acquis and the security policies of the Union. During the Conference on Cyprus, he said, it was underlined that Cyprus is an EU member state and will always have this capacity thus the EU has a role to play. Asked if the EU can offer security, he said `of course it can` if and when there is such an agreement. The Treaty on Guarantees, he noted, is a four – party treaty, but in essence a two-party treaty, between the Republic of Cyprus and the three guarantor powers (Greece, UK and Turkey). President Anastasiades noted that the discussion on the internal aspects of the Cyprus issue and the aspect of security and guarantees give a momentum to the process. There are issues, he said, that will depend on the results of the discussion on security and guarantees, as well as on the progress on the territory chapter. He defended his decision on the 1st of December 2016 for the Geneva talks to resume in January (9-11 of January on internal aspects of the Cyprus issue and 12 of January for the Conference on Cyprus to take place). President Anastasiades said that his decision aimed at two goals, firstly to avoid a protracted stalemate and to finally determine the intentions of Turkish Cypriot side and especially Ankara`s intentions, regarding the chapters on territory and security and guarantees. The outcome of the Geneva Conference reaffirmed that his decision on the 1st of December was the right one, he said, adding that through the dialogue in Geneva there has been further progress on the first four chapters of the Cyprus talks. But he pointed out that this progress does not entirely meet the expectations of the Greek Cypriot side. Cyprus President Nicos Anastasiades and Turkish Cypriot leader Mustafa Akinci discussed on Tuesday morning in Geneva four pending issues of the chapter of Governance in the framework of their UN-led negotiations on the Cyprus problem, which continue here from January 9-11. Among these issues were the participation and the decision making process for the federal institutions and the amendment of the constitution. A Greek Cypriot side source has described once again the issues being discussed as “very difficult”, adding however that there are prospects for progress in one of the aforementioned issues, while others are more difficult. It also noted that there are aspects addressed at the negotiations which will affect all issues under discussion, if they are solved, both in the Chapters of Governance and Property. Such issues are the Turkish Cypriots` effective participation which is related to the chapter of Governance and the treatment of Turkish Cypriots, Turkish settlers and citizens from third countries as regards the property issue. With regard to this issue, there is disagreement between the Turkish Cypriot and the Greek Cypriot sides as the latter believes that these three categories of people should be addressed on a different basis. If this issue is settled, then 80% of the property issues will have been solved, the same source has indicated. As regards the issue of the international Conference on Security and the Guarantees that will begin in Geneva on January 12, it noted that as things stand right now there will be a representation at Foreign Ministers level. The same source also said that during his meeting with the National Council on Monday evening President Anastasiades said that he had on Monday afternoon a very good and constructive discussion with Akinci on the Security and Guarantee issue and that the intention is to address concerns being raised. Anastasiades and Akinci have been engaged in UN-led negotiations since May 2015 with a view to reunite the island under a federal roof. The famous British Cypriot singer-songwriter George Michael, Georgios Kyriakos Panayiotou, sadly passed away at his Oxfordshire home on Christmas Day aged 53 years-old. His death has been said to be due to a suspected heart failure. The UK Greek Cypriots feel like they‘re saying goodbye to one of their own. 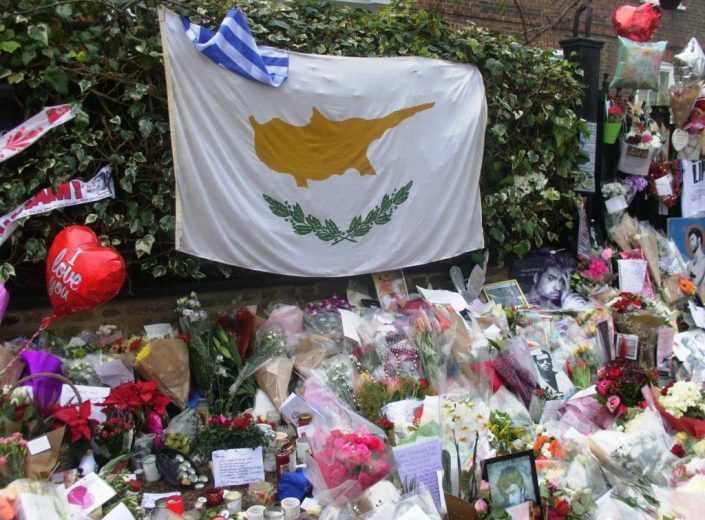 People from all over the country have visited his Highgate house to lay flowers, cards and candles; you can see the Greek and Cypriot flag hoisted on the fence gate of his place. George Michael was born on June 25th 1963, in East Finchley. He leaves behind his father Kyriacos Panayiotou, aka Jack Panos, a Greek restaurateur from Patriki in Karpasia and his two sisters Melanie and Yioda. His mother Lesley Anigold Panayiotou was an English lady and a dancer who passed away in 1997. George Michael was known to have generously pledged his signed discs for London Greek Radio‘s Radiomarathon appeal, he never liked it publicised as such although the set-up around the charity would often mention it on-air and very understandably. Cyprus’s Deputy Government Spokesperson, Victoras Papadopoulos, and ex-journalist of London Greek Radio, speaking to Cypriot media’s Sigma Live reflects about his personal encounter with pop star George Michael. ”I met George Michael while working as a journalist for London Greek Radio between 1989 -1995 during my postgraduate studies,” Papadopoulos told Sigma Live English. London Greek Radio has been supporting Radiomarathon Centre based in Turkey Street in the borough of Enfield, where the listeners fundraising is helping children and young adults with learning disabilities at the centre, for a number of years. Since George Michael’s death, revelations of his acts of kindness and generosity have seen the light of day, for a person who liked his anonymity to be kept. His philanthropic acts helped Terrence Higgins Trust and Macmillan Cancer Trust, as did the UK Thalassaemia Society (UKTS), of which he was Patron. He gave a student nurse £5,000.00 to cover her debt and £15,000.00 for IVF treatment all anonymously. He also issued free tickets to nurses to watch his concert in Wembley. All the royalties to his 1996 single ‘Jesus to a Child’ went to Childline, reveals its founder and president Dame Esther, very determined it wasn’t out in the public knowledge. High-level Cypriot figures and individuals have added tributes including the President of the National Federation of Cypriots in the UK Christos Karaolis speaking to London Greek Radio, stated: ”George Michael is one of the most well-known U.K. Cypriots, selling over 100 million records worldwide and winning multiple music awards including 3 Brit Awards. Through his outstanding contribution to the music industry and charity over the years, he highlighted the proud and exceptional contribution of Cypriots to the UK. He will be greatly missed but his legacy will live on. Our hearts go out to his family”. The singer Andy Kyriacou writing on his Facebook page tells of his knowing Michael. ”We all know how talented he was, but he was also one of the loveliest and most genuine guys that I met on the music scene. I came across him regularly in the 80’s and he was so polite and gentle, always making the effort to come and say Hi. I’m proud to have made his acquaintance and equally proud that he was a fellow Greek Cypriot. Another great person taken from us with still, so much to offer. RIP George”. One of our listeners actor Jimmy Andreas speaking on London Greek Radio recollected a personal story at Michael’s dad’s restaurant, during the heyday of his fame in the 1980’s Wham! He said a young Cypriot girl, a huge fan, she was absolutely delighted to see George Michael in the restaurant, ‘This is my son!’ his dad Jack proudly asserted. Known as Yogo to his friends was inspiring others particularly Cypriots in the creativity industry, such as actress Eve Polycarpou. She was one-half of comedy duo Donna and Kebab alongside Martha Lewis in the 80’s, she felt empowered and inspired in ‘so many ways’ by his successes, in the 1980’s. Seeing British Cypriots excelling in the performing arts, breaking through was a totally big thing she pointed out on her Facebook page. Pop star Peter Andre said that George Michael was ‘an incredible talent’ and that his is ‘an incredible loss’; while the distinguished maternal fetal medicine specialist Professor Kypros Nicolaides said he was shocked by news of the singer’s death and that he felt proud to share Cyprus with him as their fatherland. The well-known psychologist and author Dr Linda Papadopoulos said that a George Michael poster used to be the biggest one in her teenage room wall. ”I was a fan of George, in every way, throughout my life and I’m truly devastated that he left this world so early – he brought so much happiness to so many. My thoughts go out to his family at this very difficult time. Rest in Peace, amazing George; not sure how this world is ever going to dance again without you here,” Dr Papadopoulos. UK Cypriot entrepreneur Theo Paphitis tweeted that George Michael was an ‘unbelievable legend’ and singer-songwriter Yusuf Islam/Cat Stevens (born Steven Demetre Georgiou) tweeted that he was very sad to hear of his ‘Cypriot brother’ passing away. The late pop icon will reportedly be laid to rest at Highgate Cemetery, next to his beloved mum in the family’s private plot. Full details of the funeral are yet to be announced but it’s believed there may be two ceremonies – one for the family and another for fans. R.I.P George, rest with the angels. Legend… You will live on forever. The UK is working with the United Nations to retain momentum in bringing lasting peace to Cyprus, British Minister of State responsible for Europe and the Americas, Sir Alan Duncan has said. Duncan met on Wednesday with the UN top envoy on Cyprus, Espen Barth Eide in Greece. Cyprus President Nicos Anastasiades and Turkish Cypriot leader Mustafa Akinci are about to meet in Geneva Switzerland on January 9-11 in the context of the UN-sponsored talks to discuss all outstanding issues for a Cyprus settlement and exchange maps. On January 12 a conference on Cyprus will be convened in the presence of the guarantor powers (Greece, Turkey and the UK) and other relevant parties as needed to discuss the issue of guarantees and security. Cyprus has been divided since 1974, when Turkish troops invaded and occupied its northern third. President Anastasiades and Mustafa Akinci have been engaged in UN-backed talks since May 2015 with a view to reunify the island under a federal roof.